​Sasha-Niccole will be begin a certificate in Relationship Counseling at Keplar College of Astrological Arts & Sciences school this fall. She currently has a Certificate in Business Administration from Mount Saint Vincent University in Halifax, Nova Scotia. ​Sasha-Niccole is originally born and raised in Halifax, Nova Scotia having moved to Miramichi in November of 2014. 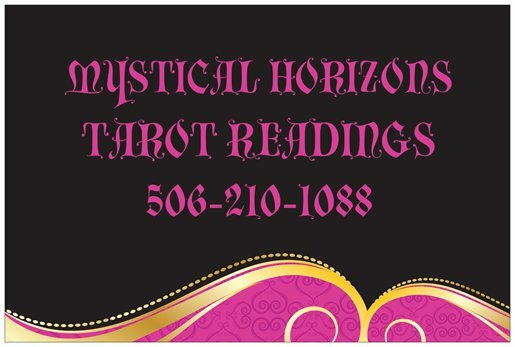 Her business, Mystical Horizons Astrology Store will be opening this fall at 138 Newcastle Boulevard. Her business will include, but is not limited too an astrology store, a classroom which hold 8-10 people, her tarot room, and five additional rooms that are being rented by people of similar backgrounds to her. Please join Sasha-Niccole and the Mayor, Adam Lordon, at the Grand Opening of her store on Saturday, September 2nd, 2017 at 9am for the ribbon cutting ceremony. 10% of all proceeds made that day are being donated to the Miramichi SPCA. All content provided on this Web site is for informational purposes only. in this information nor for the availability of this information.